Counting lament among our one thousand gifts. I confess I am something of an armchair tourist. I travel when I have to, but many of the world's great destinations also have, in addition to their sights, sounds and smells I would prefer to explore second-hand from the comfortable quarters of my sofa. I'm something of an armchair theologian, too. I engage when I have to, but have often preferred to travel vicariously with brave spiritual adventurers, curled up with a book on that same sofa. 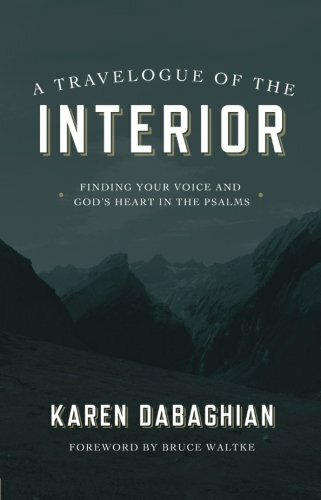 Karen Dabaghian's A Travelogue of the Interior: Finding Your Voice and God's Heart in the Psalms caught my attention: promising to be a travel guide through the highs and lows of the Psalms, pausing for snapshots at the more spectacular vistas. Dabaghian is something of an accidental tourist herself. She enrolled in a class on the Psalms that required participants to write a poem in response to each psalm. The year she spent "Psalms Journeying," as she calls it, profoundly changed the way she engaged with God, and her understanding of how God engages with us. Her Travelogue is something of a memoir, then, telling the story of how (in that mysterious way that God works) each of the Psalms and their corresponding poems of response provided a divinely orchestrated road map for the circumstances she faced that year. Dabaghian (she tells us so) is a relentlessly driven A-type personality, but the Psalms caused her to slow down and pay attention to the strike of her heel on the path, discovering the careful and caring companionship of God along the journey. But this book is also more than a memoir: it's an invitation to readers to chart their own journey through the psalms, and consider writing poetry—even truly terrible poetry—in response to God. "Why poetry?" you might ask. Dabaghian explains that poems do the work of making us slow down and process deeply: "I discovered the incredible power sacred poetry has, in God's sure hands, to help us grieve, to heal us, and to knit us to each other." Having never written anything more compelling than a haiku myself, the challenge to write our own poetry left me unsure whether I wanted to continue reading. However, even though I declined the invitation to write my own variegated verse, I still found the book beautifully written, winsome and deeply instructive. In the way of the very best travelogues, the majesty of the scenery was captured on the page. One spiritual vista, in particular, stood out: Dabaghian's conviction that lament is a gateway to joy. If we are to truly engage with God in the real and raw way which the Psalms invite us to do, she writes, then we will also need to learn how to deeply lament before we can deeply praise. "Lament," says Dabaghian, "is the act of pouring out in thoughtfully crafted, brutally honest speech all the accusatory, self-serving, pain-drenched thoughts and emotions that fester in the deepest recesses of my soul when God doesn't come through for me in the way I believe He is supposed to … . Lament is casting our full selves on the fathomless mercy of God, because only His mercy is big enough to bear witness to our bitter accusations and still let us live." Lament is more than the trained grief which says, "God, I'm sad, but you're still God and I praise you." According to Dabaghian, the real work of lament is "sifting through God's role in whatever circumstances have given rise to our need to grieve in the first place. We give God credit for the blessings in our lives, and rightly so, but we shy away from holding God accountable for the pain." The challenge of lament is to deal with "the horrors … that seeped under our skin and haunt us months, years, even decades later, despite our best efforts to 'get over it.' "
Thus lament supremely honors the truth that God is holy, "but it also points with equal candor to the reality that as human beings, we arrive at God's throne broken and sinful and—oh the scandal!—passionately wanted and welcome." Finding that God loves us in this heartache, with this love, was the mountain-top of Dabaghian's climb: an unparalleled vista of exceeding joy. And I, as an armchair traveler, caught my breath at the scene. Dabaghian pays tribute to Ann Voskamp's One Thousand Gifts, the book which taught us the discipline of eucharisteo and the joy which is found in a life of gratitude. Eucharisteo leads to epinaio (praise), a truth which Travelogue of the Interior is quick to affirm. Choosing thanksgiving is a gateway to joy. The treasure that Dabaghian's Travelogue adds to the conversation is its acknowledgement that thanksgiving (the spiritual discipline of naming graces) is not the only spiritual path toward the Joy-Giver. Lament (that spiritual discipline of choosing to name disappointments) is also a well-trodden spiritual path, and one which the broken-hearted may walk hand-in-hand with a tender and faithful God, finding his grace as strongly there. Bronwyn Lea's writing has appeared at Her.meneutics, the Huffington Post, and many other sites.